November 2 (6:00 PM – 8:00 PM) & November 3 (8:00 AM – 11:30 AM) at St. Catherine Greek Orthodox Church in Chandler. Childcare for 3yrs and up! Good will offering of $10 is kindly encouraged. Love to sing? Join your brothers and sisters from Orthodox parishes throughout the Valley for “One Day, One Hymn, One Church,” the first-ever Arizona pan-Orthodox Choral Fellowship event, to be held at Holy Trinity Cathedral on Saturday, September 22nd, from 10am – 3pm. The day will include singing, fellowship, lunch, more singing, and finish with an audio/video recording of the world premier of Psalm 23, a choral arrangement by Fr. Michael Pallad, which will be posted on social media. If you love to sing, you’re going to want to be part of this awesome event! Please join our Brothers & Sisters at the host parishes for these Sunday Evening Lenten Vespers services. On Saturday, February 24th, Presvytera Deborah will be hosting a Prosphora Bread Baking Class at our home. Space is limited (our kitchen is small! ), so let her know as soon as possible if you plan to attend. A prosphoron (Greek: πρόσφορον, offering) is a small loaf of leavened bread used in Orthodox Christian liturgies. The plural form is prosphora (πρόσφορα). The term originally meant any offering made to a temple, but in Orthodox Christianity it has come to mean specifically the bread offered at the Divine Liturgy (Eucharist). Prosphoro is made from only four ingredients, wheat flour (white), yeast, salt, and water. Salt was not used in early times, and is still not used in the Greek Orthodox Church of Jerusalem. Any member of the church who is in good standing and whose conscience is clean may bake prosphora. Often in a parish church the women will take turns baking the prosphora; in monasteries, the task is often assigned by the Hegumen (abbot or abbess) to one or several monastics of virtuous life. It is common but not necessary to go to confession before baking prosphora, and it is often done in the morning while fasting. Sometimes, special kitchen implements are used for making the prosphora which are used for no other purpose. There may be special prayers said before commencing, and the baker tries to maintain a religious state of mind throughout, often saying the Jesus Prayer. Usually enough prosphora for a number of services are baked at the same time. A prosphoron is made up of two separate round pieces of leavened dough which are placed one on top of another and baked together to form a single loaf. This double-loaf represents the two natures of Christ: human and divine. 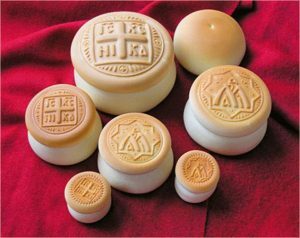 Before baking, each prosphoron is stamped with a special seal called sphragis or Panagiari usually bearing, among other things, the image of a cross with the Greek letters IC XC NIKA (“Jesus Christ conquers”) around the arms of the cross. This impression is baked into the bread and serves as a guide for the priest who will be cutting it. In the Slavic practice (Russian Orthodox, Bulgarian Orthodox, Serbian Orthodox, etc.) five smaller prosphora are used (in commemoration of the five loaves Jesus used to feed the multitudes). In the Greek practice one larger prosphoron is used (in commemoration that all share in one “Bread” 1 Cor 10:16-17). See more information at All Saints of North America Orthodox Church website. On Saturday, December 9th from 4:30-6:30pm there will be a service opportunity for St. George Antiochian Orthodox Church. The organization is Feed My Starving Children, a national based Christian organization. Volunteers are needed to help pack food which will go to malnourished children around the world. There are 30 volunteer spots. For more information, contact Matthew Peters. Rev. Dn. Stephen Muse, PhD, LMFT is a pastoral counselor, marriage and family therapist. He is Director of Education and Counselor Training at the Pastoral Institute, Inc. in Columbus, Georgia where he is also directs Clergy-in-Kairos, a nationally recognized intensive out-patient stress and wellness program for clergy and their spouses. Prior to his entry into the Greek Orthodox Church in 1993, he pastored a Presbyterian congregation for 11 years and helped begin an out-patient psychiatric clinic in Delta, PA. He serves on the Assembly of Canonical Bishops Pastoral Praxis Committee, as an advisor to the OCA task force on Spiritual Abuse and is past president of the Orthodox Christian Association of Medicine, Psychology and Religion and now serves on the Advisory Board. Fr. Stephen is a founding member and first parish council President of Holy Transfiguration Greek Orthodox Church in Columbus, GA where he currently serves as a deacon. He and his wife Diakonissa Claudia have four children, a grand-daughter and four grandsons. They live in Columbus, Georgia. Be Your Self – Amim’s Great Discovery (Greek and English editions, 2016). Lunch is free. An offering will be taken to cover costs. Please reserve a seat so we can plan accordingly. Email frthomasfrisby@gmail.com or call 602-867-6025 with your reservation confirmation. What did the Apostle John see when he looked in the empty tomb? What can ancient historical records, astronomy, early iconography, ancient coins, pollen grains, rock dust, bloodstains, and DNA on two ancient linen cloths reveal about the Crucifixion, Burial, and Resurrection of Jesus Christ? A new Orthodox Mission is being formed in the Lake Havasu City area of Arizona to serve the spiritual needs of Orthodox Christians of all jurisdictions and be an outreach to those seeking entry into the Orthodox Church. On May 17, the first divine liturgy was celebrated with a group of twelve parishioners! The formation of the mission has the blessings of Metropolitan Gerasimos of the Greek Orthodox Metropolis of San Francisco. For more information contact Fr. Andrew Barakos (480) 991-3009, the vicar of the southwestern region of the Metropolis of San Francisco.